Admittedly, it doesn’t look very impressive – but this was the product of many hours of dedicated labour – and it tastes – well, like Rye Bread – so job done. Two books have both enthused me about making bread over the last year. One I’ve already mentioned on this blog – Dough by Richard Bertinet. The other, and the one which this recipe comes from, is The Handmade Loaf by Dan Leppard. The recipes in The Handmade Loaf were collected by Dan from around Europe. Dan Leppard’s approach to bread making is not for the impatient or the short of time. Many of them rely on a natural leaven – that is a ferment made from naturally occuring yeast. Initially the leaven takes several days to get going, but once you have a mixture that is fermenting you can keep it going by ‘feeding it’ – that is topping it up with flour and water. As you can see – this has already taken you 5 days – and you haven’t even started on the bread yet! However, for the Rye Bread I needed a Rye Leaven instead of the white leaven that is described here. To make a Rye leaven you simply take the leave above and start feeding it with Rye flour and water rather than strong white flour and water. However with Rye flour you need a bit more water – I ended up using 125g Rye and 125g water for each refresh. I repeated this over a few days, refreshing roughly every 48 hours discarding 3/4 of the mixture and adding these proportions of water and rye flour – I think I refreshed like this 3 or 4 times. Boil water and measure out 240g – then let it cool to 90 degrees, and then whisk in 60g of rye flour – I have to admit I didn’t measure the temperature, I just boiled the water, poured out 240g into a bowl, and then whisked in the flour. 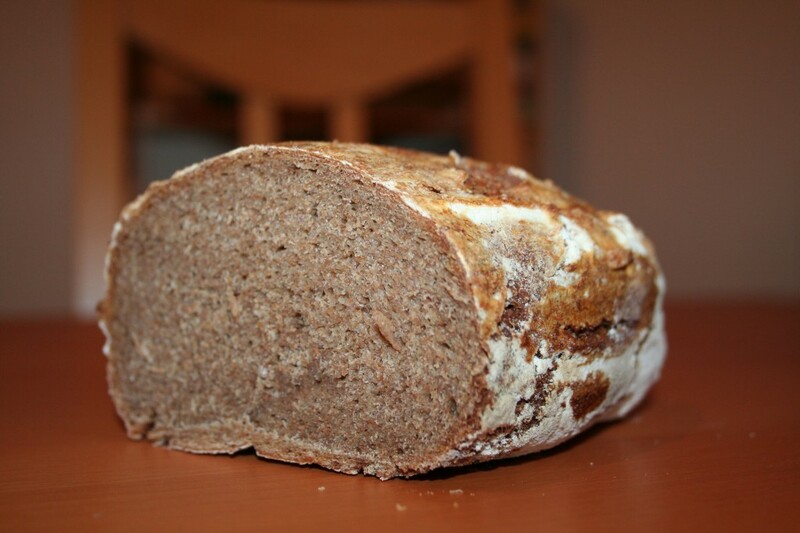 The recipe suggests that adding the flour to water at different temperatures creates different textures to the final loaf. The recipe says to knead this ‘gently’ on an oiled surface – I have to say I found this very difficult. The dough was extremely wet, and despite the oil stuck to the surface quite quickly. From the description in the recipe it is not at all clear if you knead for just a few minutes, or until the dough firms up a bit and becomes easier to handle. I was a bit less ‘gentle’ with the dough to try to get it to firm up, but in the end floured my hands liberally (although trying not to put more flour into the mixture, since in general the recipes Dan Lepard gives do result in quite wet doughs – and this is deliberate not a mistake), and shaped into a loaf. Once you have a loaf, wrap in a (very very) well floured cloth, and leave to rise for 5 hours. The recipe suggests the loaf will double in size – mine didn’t come close to this. Although you could tell that the dough had relaxed somewhat, it was hard to see if it had actually increased in size at all after 5 hours – maybe just a very little. Turn the loaf onto a floured tray, and brush the top of the loaf with the leaven/flour/water mix from earlier, spray the loaf with water and bake in the over for 50 minutes, spraying again after 5 minutes. The resulting loaf will be dense (I thought I’d baked a brick when my came out) – but will have that very distinct, and delicious, rye bread flavour. The bread goes well with a good hard cheese (something strong like Lincolnshire Poacher), smoked salmon, or just with some nice creamy butter. It may take 6 or so days to make, but it is worth it.